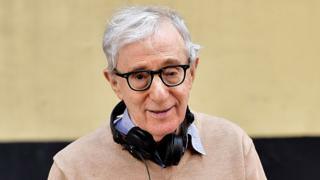 Amazon Studios has said it was "justified" in terminating its film deal with Woody Allen. The movie/TV distributor has alleged the US film director's comments about the #MeToo movement "sabotaged" its attempts to promote his movies. Allen is suing the company, claiming it abandoned a four-film deal amid resurfaced allegations he molested his adopted daughter. He strongly denies the accusations, which first emerged in 1992. The 83-year-old is claiming more than $68m (£52 million) in damages, alleging a breach of contract after Amazon Studios failed to release A Rainy Day In New York. However, in a response filed on Wednesday, the company asked a New York judge to reject portions of the case, saying it went into a deal with Allen in August 2017, two months before allegations against movie producer Harvey Weinstein sparked a wider backlash against alleged abuse in the entertainment industry. Allen then "made a series of public comments suggesting that he failed to grasp the gravity of the issues or the implications for his own career," lawyers claim. Allen reportedly expressed sympathy for Weinstein, then months later accused his daughter, Dylan Farrow of "cynically using the #MeToo movement," when she repeated her allegations that her father had abused her. Those comments came as Amazon Studios were trying to promote another of his films, Wonder Wheel, "effectively sabotaging those efforts," the company said. Amazon pointed out a number actors expressed their regret at working with Allen and stars including Rachel Brosnahan, Colin Firth and Michael Caine vowed never do so again. Allen was quoted as saying he "should be the poster boy for the Me Too movement" as despite having "worked in movies for 50 years," and with "hundreds of actresses," he has "only (been) accused by one woman in a child custody case." "Understood in the broader context," said Amazon, "Allen's actions and their cascading consequences ensured that Amazon could never possibly receive the benefit of its four-picture agreement (despite already having paid Allen a 10 million-dollar advance upon signing). "As a result, Amazon was justified in terminating its relationship with Allen, and Plaintiffs ultimately will not recover any of the relief they seek."